Secrecy: the American experience, Yale University Press, 1998. Miles to go: a personal history of social policy, Harvard University Press, 1996. Pandaemonium: ethnicity in international politics, Oxford University Press, 1993. On the law of nations, Harvard University Press, 1990. Came the revolution: argument in the Reagan era, Harcourt Brace Jovanovich, 1988. Family and nation: the Godkin lectures, Harvard University, Harcourt Brace Jovanovich, 1986. Loyalties, Harcourt Brace Jova novich, 1984. Counting our blessings: reflections on the future of America, Little, Brown, 1980. Coping: essays on the practice of government, Random House, 1973. The politics of a guaranteed income: the Nixon administration and the Family assistance plan, Random Ho use, 1973. Maximum feasible misunderstanding: community action in the war on poverty, Free Press, 1969. The future of the family, edited by Daniel P. Moynihan, Timothy M. Smeeding, and Lee Rainwater, Russell Sage Foundation, 2004. 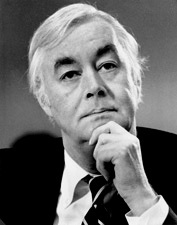 A dangerous place, Daniel Patrick Moynihan, with Suzanne Weaver, Little, Brown, 1978. Ethnicity: theory and experience, edited by Nathan Glazer and Daniel P. Moynihan, Harvard University Press, 1975. On equality of educational opportunity, edited by Frederick Mosteller and Daniel P. Moynihan, Vintage Books, 1972. Toward a national urban policy, edited by Daniel P. Moynihan, Basic Books, 1970. Urban America: the expert looks at the city, edited by Daniel P. Moynihan, Voice of America Forum Lectures, 1970. On understanding poverty: perspectives from the social sciences, edited by Daniel P. Moynihan, with Corinne Saposs Schelling, Basic Books, 1969. Beyond the Melting Pot: The Negroes, Puerto Ricans, Jews, Italians, and Irish of New York City, Nathan Glazer and Daniel Patrick Moynihan, MIT Press, 1963. "The Open Mind - Taking a Stand for American Beliefs (September 27, 2007)"